The talk among the indie authors that I have been following for a little while is that the summer months are pretty lean. Sales slow, sometimes to a trickle. It's not something that happens just to indie authors, either. The entire publishing world slows down in the summer. That's why I was trying to keep my head up when sales for July were non-existent early on. The first week of the month went by and I hadn't sold any books. It was OK. I've had slow starts to months before. The second week passed with no sales and I tried to tell myself that it was OK. The summer is slow. But, to be honest, I was starting to worry. Had I tapped out my market? Had everyone who was interested in buying a copy of my book already bought one? I felt like most of the copies I'd sold up to that point had been the equivalent of hand sales in a bookstore. Someone had met me online somewhere and decided they either liked me well enough that they wanted to support me with a purchase, or they liked what I'd said about Chasing Filthy Lucre and they wanted to buy it. Either way, my sales required some interaction with me. And that's all fine, but at some point if you aren't meeting dozens of new people every day you'll eventually run out of people to buy your book. I mentioned my sales drought on Twitter and someone who's been following me for a while bought a copy. I didn't care if it was a pity purchase. It was something. Then, just a few minutes later, my mother-in-law bought a copy through Smashwords. So two sales in a matter of minutes. That's great, and if it ended there then I was happy. At least I wasn't shutout for a month. But it didn't end there. I've continued to sell about a copy a day since then and right now July is turning into a pretty average month. Not a record-setter, although it could be if sales pick up and we can get more than one a day to close the month. But July won't be my worst month ever. It will land somewhere in the middle of months, and, after the way it started, I'm perfectly happy with that. I have some more thoughts about July and sales, but I'll save those for next week. This post has already gone on too long. I'll leave you with links to places you can purchase Chasing Filthy Lucre, you know, in case you wanted to help turn July into a record breaker. We got back from a quick trip to Galveston last night. We are trying to wring the last bits of fun we can out of the summer before Gina goes back to work. She's at less than a month now. Kids come back on Aug. 22 and she has to report a week before that. We had a great time. Gina and I had each previously been to Galveston, but it was years ago. Back then neither of us left the place that impressed. It seemed like a bit of a dump, so we were in no hurry to go back. But so many people we know had gone there this summer that we both thought that maybe we ought to give the Texas coast another shot. I won't bog you down with a detailed description of our trip, but, other than Gina's sunburn, the only thing we'd change is to make it longer. We had a great time and getting to spend a few hours on the beach was just what I needed. We got to drive around the area a bit and more than once we said, "I can't believe this is our state." It's easy to forget when we are up here in Dallas sweating out 25 straight days of temperatures above 100 degrees that there is an ocean less than a day's drive away. I haven't been on the blog in a few days, but I have been other places online. I was at Allan Guthrie's Criminal-E blog on Monday. It features crime writers with e-books out. You can read the interview by clicking here. And today I have a guest post at author Thea Atkinson's blog. It's a writing prompt post, but I talk about ideas. If you ever wondered where the idea where Consider Us Even and Chasing Filthy Lucre came from then click here. Author Declan Burke sent me a few questions. I answered them. He posted my answers this morning. Check it out if you want to get my thoughts on which crime book I wish I'd written, my most satisfying writing moment, and a very small sneak peek at the next book in the New Eden series. And, yes, Declan Burke is Irish. I'm international. If you've found your way here because of the interview and are interested in buying a copy of my book then, first, thanks. I appreciate it. Second, use these links. I still have my beard. It's neatened up from when I was on vacation, but it's still here. I've had it three weeks now and I've learned a couple of things while having it. Here they are. 1. Both men and women will notice you have a beard, but very few women will compliment it. They'll say, "You have a new look." Or they'll say, "You have a beard." They will rarely follow that initial statement with a compliment. Men, however, almost always start with "I like your beard," or something similar. I think it's more an appreciation for what it takes to grow a beard rather than actually liking your beard. And, yes, it does take some effort on the owners part to grow a beard. Pushing through the urge to shave it off early on when it's just a scraggly mess is a real challenge. And, no, I don't really care what others think. Gina likes it and that's the only opinion that matters. 2. Beards always itch. Always. It may not itch as much after it's been given a few weeks to grow, but it will always itch. Hello, blog and followers. Been a while, huh? Sorry about that. I don't have a great excuse. I've been busy, but not so busy that I couldn't have posted here. I should have. I didn't. I apologize. If you can forgive me, I need your help with something. I have a friend named Dave Wilson. I've known him since college. We met on the newspaper staff. He was our design editor. I was the managing editor. We worked together every night making sure the newspaper came out. He's a whiz with all of that design software and I asked him if he'd like giving a new cover for Chasing Filthy Lucre a shot. He'd mentioned an interest in designing book covers in the past so I thought he might be interested. He said yes and got to work. This weekend he sent me the first attempts. They are just take offs of what I'd done with the original. We are still working on a few things, but thought I'd ask all fo you what you think. Are we headed in the right direction? Is there something we should be doing but aren't? Help us out. We are thick-skinned journalists. It takes a lot to hurt our feelings so don't pull your punches thinking we'll get upset. Leave a comment and let us know what you think. *Click on the cover and you can get a bigger version. Once it's up in a new browser window, click on it again and you get a REALLY large version to inspect. I head back to the day job today after more than two weeks of vacation. We went to Colorado for a week. We hung out at home for a week. We celebrated an anniversary. We celebrated a birthday. It was fantastic. I have a great wife who made it a lot of fun. But now it's back to the day job and bringing in some money. Heading back to the day job also means I have to say good bye to vacation beard. After almost two weeks of cultivating it's going to be hard to say goodbye. So hard that it may stick around for a few days in a more neatened up version. 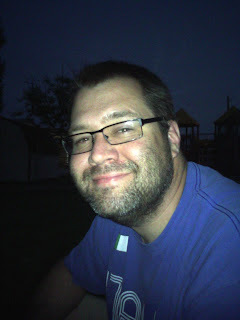 That picture of vacation beard is from last night while Gina, Molly, and I waited for fireworks. That explains the sleepy look. It was dark and the light from Gina's camera was bright. But I'm not just getting back to work at the day job, but at the writing job too. I've been slacking. I've been writing on Book 2, but not near as much as I should. I've also been slacking on my promotion for Book 1. I have a few things in the works. I bought an ad at the Red Adept Reviews site. That should appear in a week or two. I also sent a request out on Twitter asking for promotion help. I got a few responses so there should be a few interviews coming out some time soon. I'd still love to do more, though. 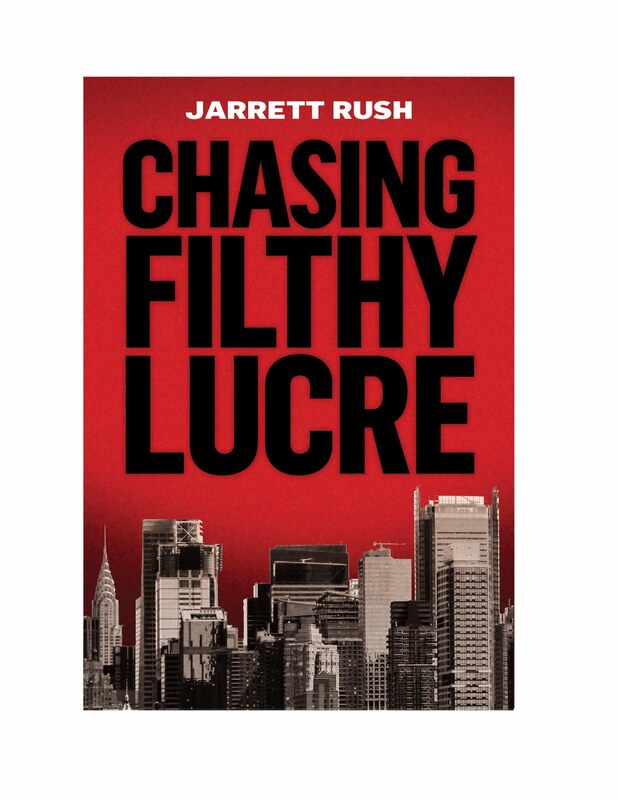 So if you'd be interested in helping me promote Chasing Filthy Lucre let me know in the comments. We should be able to work something out. If you can scratch my back, I can scratch yours. I'm up for guest posts, interviews, features of any kind.